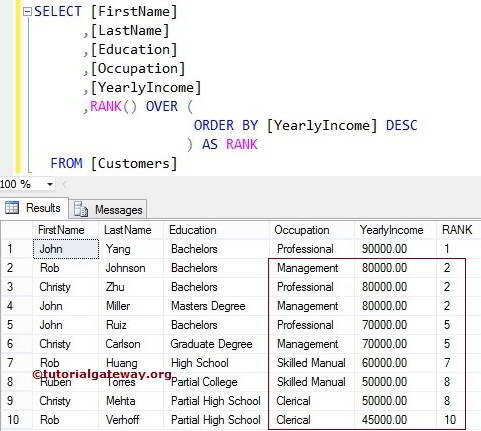 The SQL RANK Function is one of the Ranking Function in SQL Server. This function will assign the rank number to each record present in a partition. NOTE: If the RANK function in SQL encounters two equal values in the same partition, it will assign the same rank number to both values and skips the next number in the ranking. If you specified the Partition By Clause then, RANK Function will assign the rank number to each partition. If you haven’t specified the Partition By Clause then, RANK Function will consider all the records as a single partition so, it will assign the rank numbers from top to bottom. The RANK Function in SQL Server allows you to assign the rank number to each record present in a partition. In this example, we will show you, How to rank the partitioned records present in a table. 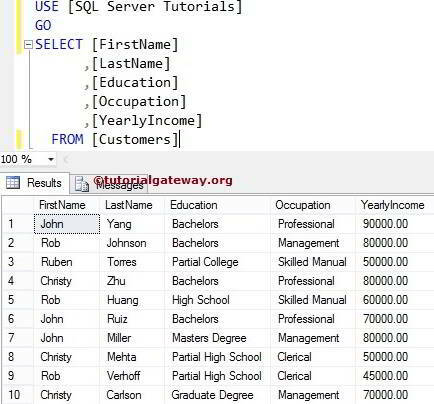 The following SQL Query will partition the data by Occupation and assign the rank number using the yearly income. 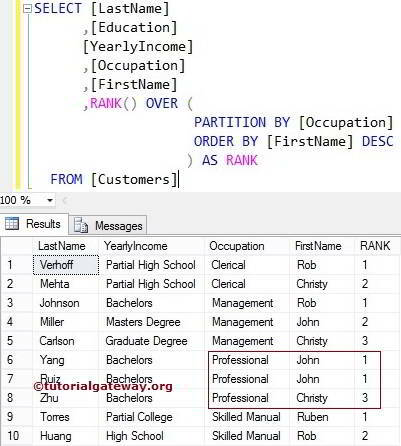 In the below statement we used Sql Server RANK() Function with Partition by clause. So, the Rank function will assign the rank numbers for each individual partition. It has given the same rank to 3 and 4 records because their yearly income is the same. Next, it skipped one rank and assigned the 3rd rank to the next record. In this SQL rank function example, we will show you, What will happen if we miss the Partition By Clause in the RANK Function. For instance, The following Query will use the above example query without Partition by clause. 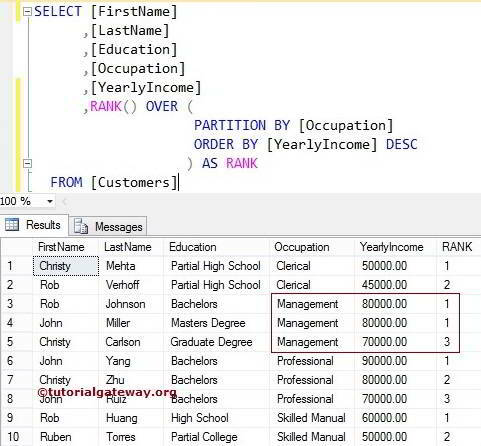 In the below statement we used RANK() Function without Partition by clause so, the Sql Server Rank function will consider them as a single partition and assign the rank numbers from beginning to end. It has given the same rank to 2, 3 and 4 records because their yearly income is the same. Next, it skipped two ranks for those two records (3, 4) and assigned the 5th rank to next record. If you observe the above screenshot, the SQL RANK Function has given the same rank to 6 and 7 records because their First name is the same. Next, it skipped one rank and assigned the 3rd rank to the next record.